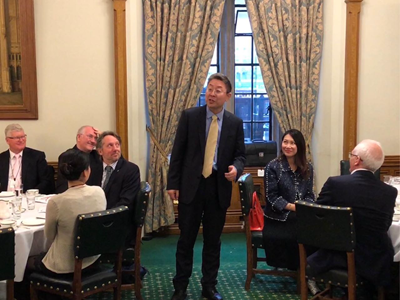 On October 19, Minister Ma Hui attended the Forum on Belt and Road Initiative which was hosted by British Chinese Liberal Democrats and delivered a keynote speech at the House of Commons. About 70 people including Rt Hon Sir Vince Cable MP,Leader of the Liberal Democrats,former Secretary of State for Business, Innovation and Skills, Merlene Emerson M.B.E., Co-chair of Chinese Welfare Trust, and representatives of the British government, business, academy and media sectors and overseas Chinese attended the forum. Minister Ma briefed the participants on the concept and achievements of the Belt and Road Initiative, and the opportunities for the UK. He pointed out that the Belt and Road Initiative, following the principles of extensive consultation, joint contribution and shared benefit, is committed to creating a community of shared future for mankind, which reflects the open and inclusive Silk Road Spirit. It is the most important public good that China has provided to the world. China and the UK have broad prospects and huge potential for cooperation on the Belt and Road. He hoped that people from all sectors of the UK would continue to follow, support and actively participate in the building of the Belt and Road, and achieve more outcomes in China-UK cooperation. 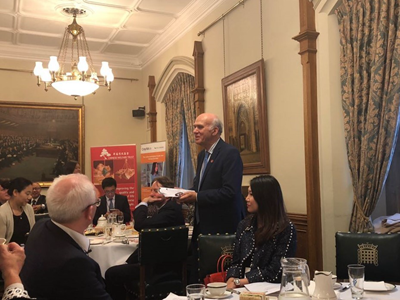 Sir Vince Cable agreed that the Belt and Road Initiative has brought great opportunities to the UK and the World. He said that the report that president Xi Jinping had delivered at the opening of the 19th National Congress of the Communist Party of China was very impressive, which showed China's positive attitude of adhering to opening up to the world and promoting international cooperation. Participants at the conference felt positive about seizing the historical opportunities, expanding the China-UK cooperation on Belt and Road Initiative, and creating a new phase of mutual benefit and win-win situation between the two countries.